Is your minor child earning interest and dividends from investments you have under his or her name? Or perhaps your minor child is working part-time over the summer as a waiter. Minors (even toddlers) need to pay income tax, and you, as the parent, need to know how to file a tax return for your under-age child. First, children are never too young nor too old to file income taxes if they have earned income or income from savings or investments. Their age doesn't matter; the amount they earn is what matters. A toddler with a savings account funded by doting grandparents may need to file for income tax, while a teenager working at odd jobs may not. Unearned income is greater than $1,050. This includes the dividends and interest on savings accounts or investments in the minor child's name. Earned income is greater than $12,000. This includes the money your minor earns at a part-time job. Self-employment net earnings that are greater than $400. Earned and unearned total income that is greater than the larger of $1,050 or earned income plus $350. Note that the above is a synopsis of the IRS rules that apply. There are numerous exceptions to these rules. 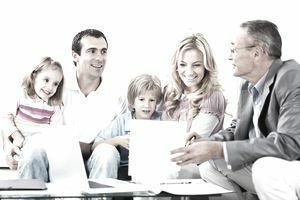 So, while the above is a reliable summary of the rules that apply, your child's requirements may differ and you should confer with an accountant familiar with your family. IRS Publication 929, "Tax Rules for Children and Dependents," goes into these somewhat complex rules in detail. Therefore, either a thorough reading of this document or consultation with your tax adviser is highly recommended. There are two ways to file an income tax return for a minor child, depending on how he or she earned their money. Attach to parent's return: If your minor is under age 19 (or a full-time student under 24), and the child's income is less than $1,500, and only from interest and dividends, it can be attached to the parent's return using Form 8814. Note also that while reporting the child's income as an attachment on your return is an easy way to file, it can result in higher taxes on qualified dividends or capital gains. Complete individual tax return for the minor: If the requirements are not met to attach it to the parent's return, or you want to ensure lower taxes, your minor child should file a return. He or she can file a simple return for free at CompleteTax. Also, see below "Optional Tax Filing for Minors." Although dependent children (under 19 years old or a full-time student under 24) pay no taxes on the first $1,050 of unearned income, they are taxed at their rate for the next $1,050. If investment income totals more than $2,100, part of your minor's income will be taxed at the parent's tax rate instead of at what would otherwise be the child's tax rate. It is the kiddie tax, which exists to make sure that the government is not losing tax revenue when parents shift income to their minor children. In addition to the income requirements, there are other circumstances when minors must file an income tax return. One example is the tax on Social Security and Medicare uncollected by an employer. Again, to understand all the requirements, see Publication 929. When you are working on filing taxes for your minor child, it's a great opportunity to teach them about taxes. If they have a job, explain to them that their employer will withhold taxes from their paycheck. At tax time, explain to your child what the 1099 or W-2 stubs mean. You should also show them where to enter the numbers on the tax forms. This exercise will help introduce your minor child to the world of taxes and tax returns. Even a minor who is not required to file an income tax return can choose to file one. Minors will want to do this if they had taxes withheld from a part-time job and they want to get a refund. Does a Teenager Need to File a Tax Return?